Photo: NASA Goddard Photo and Video. Creative Commons BY (cropped). 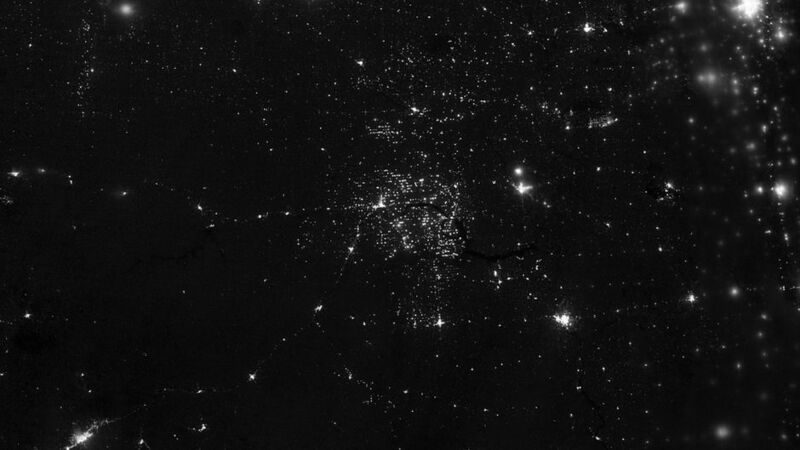 Nighttime view of widespread drilling throughout the Bakken shale formation in Northwestern North Dakota, United States, a site where gas and oil production are booming. Photo: NASA Goddard Photo and Video. This essay was originally published on TomDispatch and is republished here with the kind permission of Tom Engelhardt, who is also the author of the brief introduction. Whatever you may imagine, “peak oil” has not been discredited as a concept, a statement no less true for “peak fossil fuels.” Think of them instead as postponed. We are, after all, on a finite planet that, by definition, holds a finite amount of oil, natural gas, and coal. Sooner or later, as such deposits get used up (no matter the new techniques that might be invented to extract more of the ever tougher stuff from the earth), we will reach a “peak” of production from which it will be all downhill. In other words, while “peak oil” may be a perfectly on-target concept, “peak existence” turns out to precede it by decades and from that far more consequential “peak” we are, unlike “peak oil,” already on the downhill slide. The scientists who produced the IPCC’s draft report expect the average global temperature to increase by 3.6 degrees Fahrenheit by mid-century and at least 6.7 degrees by its end, which will leave humanity on a staggeringly less habitable planet. The damage, including the melting of the Greenland ice shield, which alone could raise global sea levels by an average of 23 feet, will be irreversible (at least on a historical — that is, human — timescale). Faced with this relatively straightforward reality, as TomDispatch regular Michael Klare, the author of The Race for What’s Left, reports today, oil companies are using remarkable ingenuity and spending billions of dollars to reach ever deeper, ever more difficult to extract, and ever more environmentally treacherous deposits of fossil fuels. No less strikingly, the Obama administration has been working energetically to pave the way for them to do so — to, that is, make real headway in removing those deposits four times larger than will be even faintly comfortable for our future. Not only is it doing so in a thoroughly drill-baby-drill spirit of cooperation with the globe’s largest and most avaricious energy outfits, but it’s bragging about it, too. In my childhood, I remember ads that fascinated me. I’m not sure what they were selling or promoting, but they showed scenes of multiple error, including, if I remember rightly, five-legged cows floating through clouds. They were always tagged with some question like: What’s wrong with this picture? Today, as in those ads, Klare offers us a picture filled with the energy exploitation and global-warming equivalent of those five-legged cows in the clouds and asks the same question. Considering all the talk about global warming, peak oil, carbon divestment, and renewable energy, you’d think that oil consumption in the United States would be on a downward path. By now, we should certainly be witnessing real progress toward a post-petroleum economy. As it happens, the opposite is occurring. US oil consumption is on an upward trajectory, climbing by 400,000 barrels per day in 2013 alone — and, if current trends persist, it should rise again both this year and next. Accompanying all this is a little noticed but crucial shift in White House rhetoric. While President Obama once spoke of the necessity of eliminating our reliance on petroleum as a major source of energy, he now brags about rising US oil output and touts his efforts to further boost production. An increase in the sales of leases for oil and gas drilling on federal lands. In 2013, the Bureau of Land Management held 30 such sales — the most in a decade — offering 5.7 million acres for lease by industry. An increase in the speed with which permits are being issued for actual drilling on federal lands. What’s called “processing time” has, the White House boasts, been cut from 228 days in 2012 to 194 days in 2013. The opening up of an additional 59 million acres for oil and gas drilling in the Gulf of Mexico, the site of a disastrous BP oil spill in April 2010. In a turnaround that has gotten next to no attention and remarkably little criticism, President Obama is now making a legacy record for himself that will put the “permanent reduction of our dependence on oil” in its grave. His administration is instead on a drill-baby-drill course to increase production in every way imaginable on US territory, including offshore areas that were long closed to drilling due to environmental concerns. Prior to the utilization of horizontal drilling and fracking technology, US crude production was indeed facing long-term decline. According to the Energy Information Administration (EIA) of the Department of Energy, domestic crude output fell from a peak of 9.6 million barrels per day in 1970 to a low of 5 million barrels in 2008. With the introduction of fracking, however, the numbers started to soar. Total US crude output jumped from 5.7 million barrels per day in 2011 to 7.5 million in 2013. Output in 2014 is projected to be 8.5 million barrels per day, which would represent a remarkable increase of 2.8 million barrels per day in just three years. The increased availability of relatively affordable oil has also spurred investment in ancillary industries like petrochemicals and plastics. Petroleum is the basic raw material, or “feedstock,” for a wide variety of subsidiary materials, including ethylene, propylene, and benzene, which in turn are used to make polyesters, plastics, and numerous consumer products. Many chemical firms have built new facilities to convert shale oil and shale gas into these commodities, a spur both to new jobs and greater tax revenues. In addition, with crude oil selling at around $100 per barrel, those extra 2.8 million barrels produced daily will add about $100 billion to the US economy in 2014, a substantial contribution to an otherwise tepid recovery. Of course, the greatest environmental fallout from the domestic oil boom will be a continuing deluge of carbon dioxide emissions into the atmosphere, further bolstering the greenhouse effect and ensuring higher world temperatures for years to come. While emissions from domestic coal use are likely to decline in the years ahead, in part due to new rules being formulated by the Environmental Protection Agency, the expected rise in emissions from oil and natural gas use will wipe out these gains, and so total US emissions are expected to be higher in 2040 than they are today, according to the EIA. As a result, we can expect little progress in international efforts to slow the advance of climate change and a steady increase in the frequency and intensity of storms, floods, fires, droughts, and heat waves. One area where American energy prowess has given us “a stronger hand,” he suggested, was in negotiations with Tehran over the Iranian nuclear program. Because the US is importing less oil, there is a larger pool of foreign oil on which our allies can draw for their needs, which has made it easier to impose tough sanctions on Iran’s petroleum exports — and so wring concessions from Iran’s leadership circle. In addition, the president and many in his administration clearly grasp the dangers of climate change — the increasing heat, drought, fiercer storms, rising sea levels, and other perils that, without serious curbs on the combustion of fossil fuels, will make the present look like a utopian moment in human history. Nevertheless, the numbers — from production to consumption — are anything but promising. According to the latest EIA projections, US carbon dioxide emissions from petroleum use will increase by eight million metric tons between 2013 and 2015; such emissions are then expected to level off, at about 2.2 billion tons per year, despite substantial increases in average vehicle fuel efficiency. With emissions from natural gas expected to rise — the inevitable result of the shale gas boom — and coal emissions experiencing only a modest decline (some of which is offset by rising US exports of coal to be burned elsewhere), total domestic carbon emissions from energy use in 2040 are still predicted to be a devastating 6 percent higher than they are today. Can there be any question at this point of how this will help ensure the sorts of predicted global temperature increases, with all the ensuing side effects, that every expert knows will be devastating to the planet? Michael T. Klare is a professor of peace and world security studies at Hampshire College and the author, most recently, of The Race for What’s Left. A documentary movie version of his book Blood and Oil is available from the Media Education Foundation. Energy: Thriving On Five Percent? Will Keystone Xl Pipeline Make Conservationists of Conservatives?